You and your face have been together through all kinds of weather. 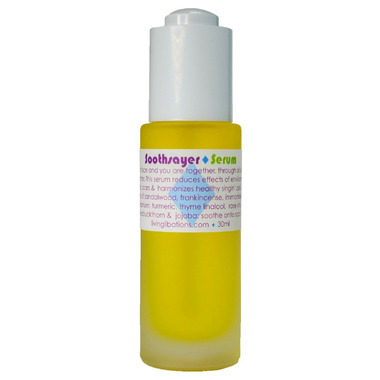 Living Libations Soothsayer Serum lets you savor the weather and save face, too. The grace of Soothsayer Serum reduces harmful effects of environmental elements on the skin and divines with the skin for extra fortification and regeneration. A wise collection of botanical oils for mature skin, this special serum softens the appearance of scars, spots and smoothes skin texture. Directions: After a freshly cleansed face with a Best Skin Ever (may we suggest Sandalwood or Rose Best Skin Ever), and apply a drop of this lovely, lightweight serum to your palm. Using your fingertips, gently pat the serum into the areas of face and skin that need extra assistance. Ingredients: Simmondsia chinensis (Jojoba), Santalum album (Sandalwood), Boswellia carterii (Frankincense), Rosa damascene (Rose Otto), Pelargonium graveolens (Geranium), Curcuma longa (Turmeric), Thymus vulgaris linalool (Sweet Thyme), and Daucus carota (Carrot Seed). Best serum ever for glowy and hydrated skin! this leaves my skin feeling so soft.